Sassyface Songbird, Tap Dancing Tart, Cabaret Momma. 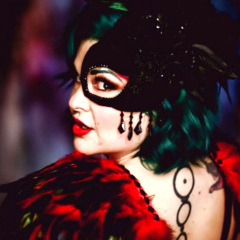 Jaynie Jezebel is one of After Midnight Cabaret singers and has dreamt of the stage since she was a small girl. She enjoys laughing till she cries, collage art, and has a twisted sense of humor. She picked tap dancing back up over the last few years and has delighted in adding a tap twist to her burlesque numbers. Cabaret’s singers, she has dreamt of the stage since she was a small girl. She enjoys laughing till she cries, collage art, and has a twisted sense of humor. She picked tap dancing back up over the last few years and has delighted in adding a tap twist to her burlesque numbers.